Papillons is my favorite Schumann work, hands down. But I generally prefer him in chamber music over the orchestral works, including the concertos. I remember buying the Bernstein recording of the four symphonies back when it first came out (on LP) and reading all about the "flawed orchestration", and I guess that prejudiced me against the large works and I have not ever gone back and revisited them. But the songs, quintets, quartets, trios, are all some of my favorite alternatives to Beethoven, Haydn & Mozart which dominate my regular listening. Perhaps Schumann's orchestration sounds flawed under Berstein's baton. On the other hand, most music sounds flawed when Bernstein is on the podium, in my opinion. I'd choose the Davidsbundlertanze followed closely by Kreisleriana and Kinderzenen. My personal favourites are the Liederkreis, op. 39 and the 4th symphony. Schumann is a composer I have grown to love over the years. My choice: the Kreisleriana, Schumann's most visionary and contrasted work. After the Kreisleriana my choice would go to the Fantasia opus 17, the Etudes Symphoniques, the 2nd Symphony and the Overture from Manfred. This is a really tough question for me. My favorite would be easy. That would be the Davidsbündlertänze. Humor and boisterousness were part of Schumann's greatness, too, and this immense gift of making the listener feel you're really one on one with Schumann as a person (one of several things that makes him greater than Beethoven to me). Let's pick symphony 4 (revised version) now, as a piece that's both grand, intimate and terribly funny, and another one later. Can't choose just one, sorry. I can't recall if I said this already, but I find that Schumann's works are at a consistently high level, without one work standing head and shoulders above the rest, so I can certainly understand your position here. How did you like them? They never fail to impress me, especially the first one. 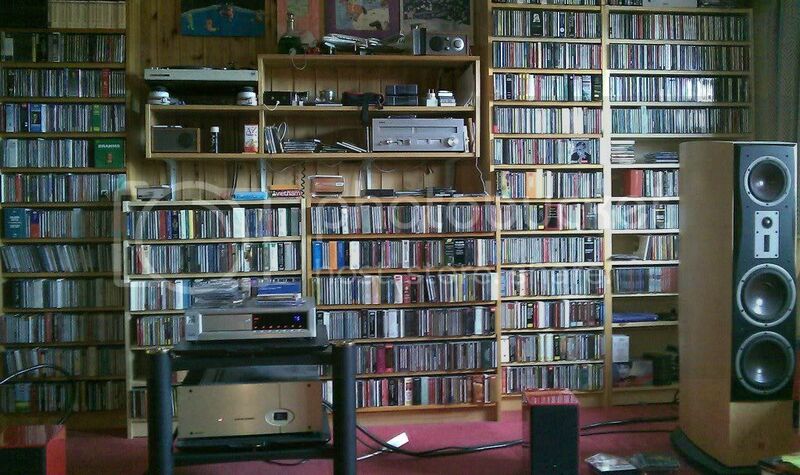 I confess that for me it has strong extra-musical associations, but the pieces themelves are very rewarding, I think. And yes, they have an innocent, pastoral quality hat I really like. This morning I listened to the Davidsbündlertänze played by Di Wu from the Cliburn competition recordings streamed from NPR's site http://www.npr.org/templates/story/story.php?storyId=104883567. I liked it in much the same way that I like the Piano Quintet: pleasant and entertaining enough, but certainly not "goosebump" material. I'm less satisfied by the op 17 Fantasie, but have only Horowitz and have just ordered a copy of Kissin's along with Kreisleriana. I'll listen to all of them from time to time over the next few weeks--thanks. 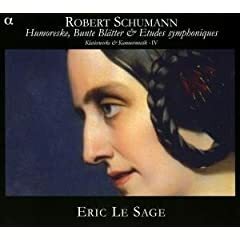 My most recent arrival is a 2-CD set w/ Eric le Sage, who is putting together a collection of solo/chamber works of Schumann; these recordings include Humoreske; Bunte Blätter; Etudes symphoniques; and Piano Sonata, Op. 11 - this is my first purchase of le Sage's efforts to record all of these particular works - any comments? This morning I listened to the Davidsbündlertänze played by Di Wu from the Cliburn competition recordings streamed from NPR's site http://www.npr.org/templates/story/story.php?storyId=104883567. I liked it in much the same way that I like the Piano Quintet: pleasant and entertaining enough, but certainly not "goosebump" material. Sorry you feel that way; I think that the Davidsbundertanze is a total "goosebump" work. If you haven't, check out Gieseking and Backhaus; Gieseking is a wild man while Backhaus is utterly primitive. If a more well-balanced presentation is your preference, give Anne Schein a visit. because I think it displays Schumann the composer at his most balanced: mature but not yet insane, a near-perfect blend between his pianistic and orchestral abilities, and at the same time one of the best examples of the "Schumannesque" quality. ...Three Romances for Oboe and Piano op. 94, anyone? Of course! Scarpia and Florestan, I've heard the Holliger but not the Pierlot; however, the Holliger is certainly worthy and I imagine the Pierlot is too. But I wonder if Ray Still or John de Lancie, longtime oboists for the Chicago Symphony and Philadelphia Orchestra, respectively, ever recorded these Romances? I prefer their tone to Holliger and Pierlot. Of the Schumann orchestral works, my favorites are the Piano Concerto, Symphonies #1 and #2, and the Manfred Overture. I confess I'm not well acquainted with much of his solo piano music aside from Kinderszenen, but I do like the Quintet. The Op.1 is quite delightful! I've got it on cassette tape with Kissin in his Carnegie Hall debut along with the Symphonische Etuden, Op.13. It may be a little bit flashy, but it's a real delight. The Op.11 is my personal favorite among the sonatas, but I'm very strongly attracted to the others. That first sonata I even prefer in most respects to the Fantasie, Op.17. He's really quite overlooked, especially since I see Schumann as having such incredible potential to give pleasure. I'd recommend a wonderful rendition of the Schumann Fantasie, recorded by the superb pianist, Arnaldo Cohen. This disc is coupled with one of the finest performances ever of the Brahms Handel Variations. One of my all time favorite CDs. One of mine also. It's a shame that Cohen doesn't get much exposure. Op 17 is way up there for me and is the Schumann work I play/listen to most often. That said, Kreisleriana is so profound in the right hands that I rate it alongside the Fantasie. The Piano Concerto and the Davidsbündlertänze. But there are so many fine works there. Page created in 0.059 seconds with 31 queries.